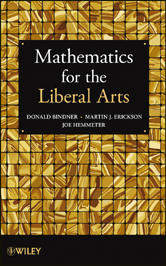 Mathematics for the Liberal Arts provides a comprehensible and precise introduction to modern mathematics intertwined with the history of mathematical discoveries. The book discusses mathematical ideas in the context of the unfolding story of human thought and highlights the application of mathematics in everyday life. Divided into two parts, Mathematics for the Liberal Arts first traces the history of mathematics from the ancient world to the Middle Ages, then moves on to the Renaissance and finishes with the development of modern mathematics. In the second part, the book explores major topics of calculus and number theory, including problem-solving techniques and real-world applications. Mathematics for the Liberal Arts is an excellent introduction to the history and concepts of mathematics for undergraduate liberal arts students and readers in non-scientific fields wishing to gain a better understanding of mathematics and mathematical problem-solving skills. 5.1 What Is Number Theory?